Project Eleanor human rights blog: Survey results -- what do NGOs think of the treaty bodies? 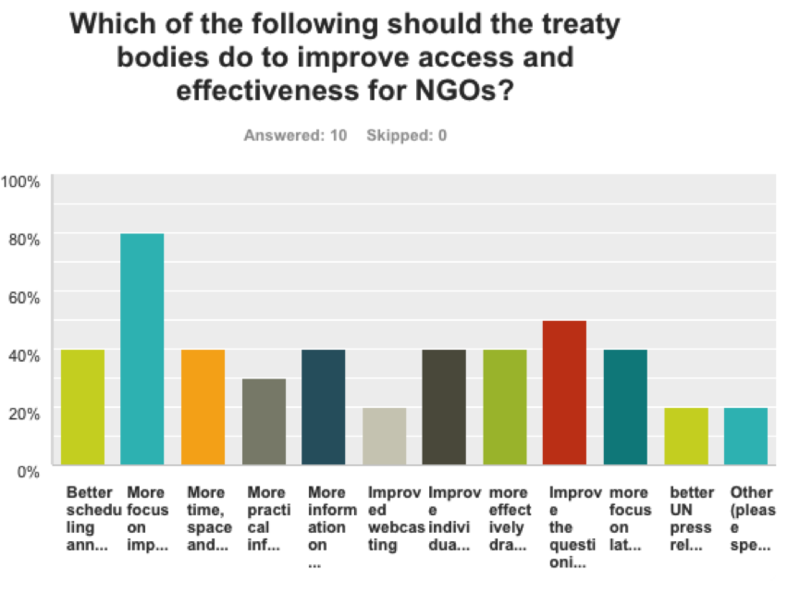 Survey results -- what do NGOs think of the treaty bodies? I posted a brief survey for NGOs at the end of 2014. The turnout was less than I had hoped (only 10 responses). I will use some different approaches next cycle to try to get a better response rate. Please note – I am not claiming this is a statistically valid sampling. 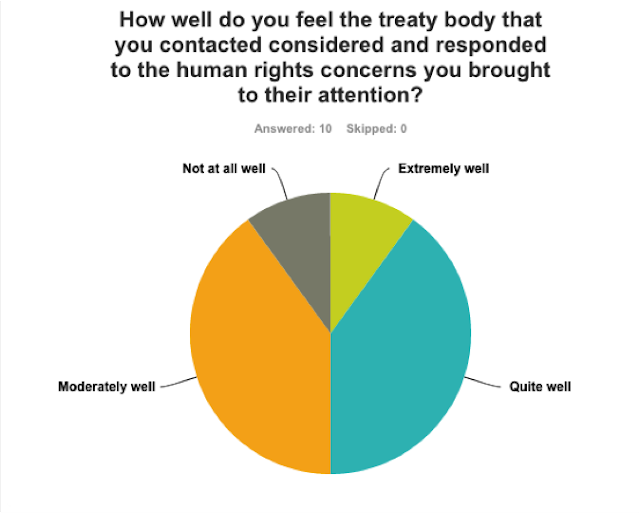 However, it still seems the results are interesting and useful in seeing the treaty body strengthening topic from the NGO perspective. 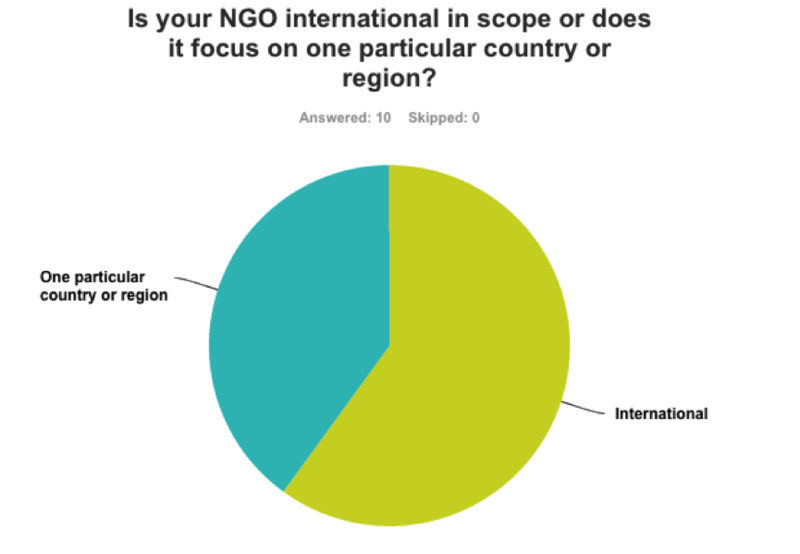 The sampling of NGOs who did respond also seems to be a fairly representative cross section of the NGOs who participate in the treaty body system – 60% international NGOs, 40% local/regional NGOs. 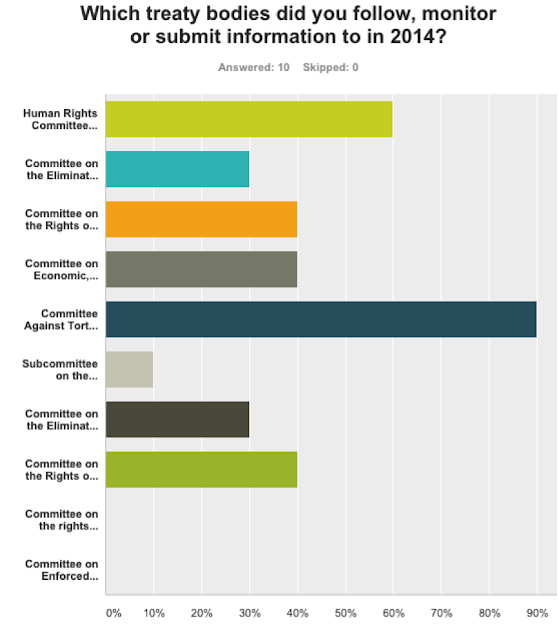 Eight of the 10 Committees in the system were followed by one or more of these NGOs. 2. Subscriber mailing lists to follow particular committees or issues. 2. Where a state party has received criticism from treaty bodies, it would be good for the treaty body to have a monitoring of NGO and news stories that highlight continued breaches and incidents of abuse, etc. This survey would seem to suggest that NGOs are satisfied on the whole with what the treaty bodies are trying to accomplish, but improvement would be very welcome too. 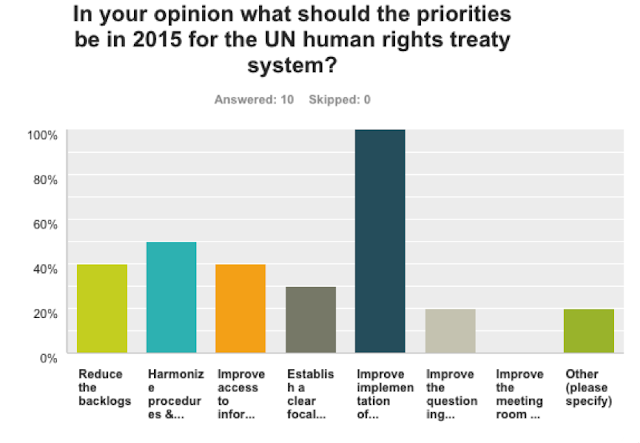 The suggestions made by some NGOs in the individual responses to questions 5 and 6 were also very interesting. The emphasis on the need for more implementation also comes through in the results. What do you think of this survey? Do you agree or disagree with these results? Any suggestions on how to make a NGO survey process like this more successful would be very much appreciated.